Essential for weather-worn and damaged skin, Ambre Blends Organic Lip Remedy naturally helps heal dry, chapped and damaged areas of your body, not just your lips! The healing configuration is beneficial to all areas of the body, including hands, lips, legs, face and more. Originating and fortified with 100% organic ingredients, Ambre Blends Lip Remedy nurtures more than cracked lips; it’s soothing to hands, feet, face and more. This balm can be used anywhere on the body to help soothe and heal chapped, chafed and cracked skin. 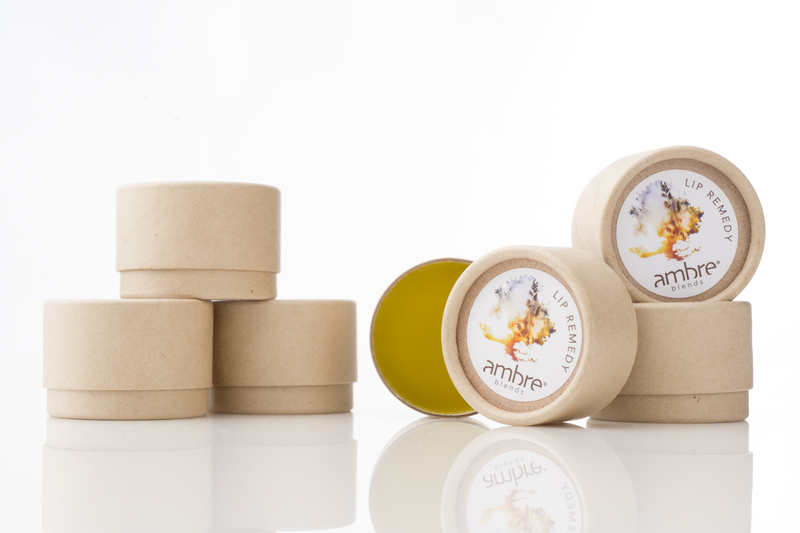 Ambre Blends Organic Lip Remedy is infused with meadowfoam seed oil, chickweed, hemp seed oil, jojoba, rosehip, shea butter, mango butter, vitamin E, avocado, coconut oil, apricot oil, olive oil infused with calendula flower & petals, plantain leaf, chickweed, rosebuds & petals, blood orange essential oil and beeswax to assist in soothing, rejuvenating and healing your skin. All ingredients used are of the highest quality and 100% certified organic. It’s also loaded with natural SPF! Enjoy the remedying effects of Lip Remedy year-round, whether you need it to help with sun-damaged skin, chapped lips or dry winter-worn hands. Gently dab Lip Remedy from the tin onto your fingers and apply on the worn, damaged area. As with all of our products, Ambre Blends Lip Remedy is paraben-free without any synthetic ingredients. We’re also excited that the Lip Remedy now comes in a new EcoPot! No pollutants are added to air, water or waste during production process of these natural containers. They are made of recycled papers and have 90% recycled and 80% PCW content, so once you’re done with it you can recycle the entire container. Please keep in mind, Lip Remedy will last longer and maintain consistency more efficiently when stored at room temperature.